Do you have trouble avoiding McDonald's Frappe's? We did! LOL!! 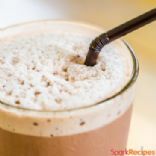 So we worked up a more healthy, protein replacement drink...we whiz it up before heading out the door and take it along in the thermos!